Pico Bonito Jungles and the Hog Cays Coral Reefs Offer the Perfect Central America Vacation. Many people ask why they should travel to Honduras. Here are just a few of the many attractions that will help you answer that question! Pico Bonito and Cayos Cochinos are the best nature and adventure vacation in Central America. Both a easily accessible from the coastal city of La Ceiba. You would be hard pressed to find another area with these assets anywhere in the World! Together, they guarantee the perfect Central America vacation! Imagine a dream destination. One where you can experience the lush tropical rain forests of Central America. 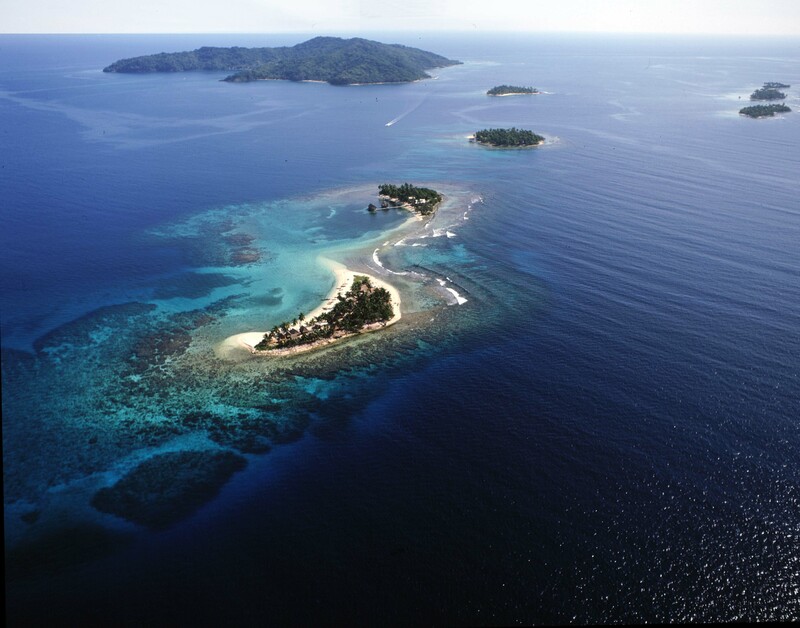 Where within a short one hour, you could replace the rugged jungle clad mountains for an island paradise. Not just any island, a pristine cay in the Caribbean Sea. An island with white sand beaches all around it. Where you can walk into the turquoise waters of the Caribbean and snorkel in pristine coral reefs. There is only one country in Central America where you can do this. It is Honduras, and it is a true Paradise. But you will say, Honduras is dangerous! Most “civilized” countries have travel warnings advising their citizens to stay away from it. Sure there are some dangerous places in Honduras. Every country on planet Earth has some of those. Most travelers visiting Honduras are surprised at how safe they feel and the great time they have. I must say that Honduras does not live up to its reputation when it comes to being dangerous for travelers. Sorry guys. Many travelers visit Honduras every year. They rarely have any incident, and if they do, it is certainly not life threatening. One of the things they enjoy the most is the fact that the country is not overrun by tourists and travelers. Perhaps the one exception is the Island of Roatan. Roatan has become a mayor port of call for cruise ships. Almost 1.2 million cruise ship passengers arrived there last year alone! Depending on the day of the week, you might find that Roatan is kind of a tourist trap, especially if you visit the West End. The East End of the Island is always beautiful and uncrowded. Honduras’ Caribbean Coast offers some of the highest and most rugged mountains on the Atlantic. Pico Bonito reaches over 8000 feet above sea level and is next to the coast. The area around this peak is Pico Bonito National Park. These mountains offer some of the densest, most impenetrable jungles in Central America. 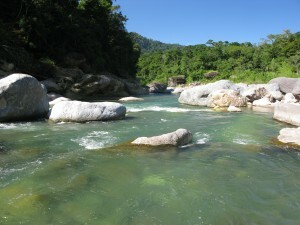 The best area to explore Pico Bonito National Park is the Cangrejal River Valley. The river forms up high, in the Nombre de Dios National Park Mountains and drops quickly into the Caribbean. There are several different lodges in the area. Some, like La Villa de Soledad are award winning properties where you can enjoy a relaxing time with nature after an activity filled day. Most of these lodges are less than 6 miles from La Ceiba. You can get there via a dirt, all weather road. The trip is scenic and enjoyable, with magnificent views of the river, the forest and even waterfalls! La Villa de Soledad is truly a jewel you will enjoy! A short 30 minute drive from the Cangrejal River will bring you to the Garifuna Village of Sambo Creek. This town is on the Caribbean Coast of Honduras, about 16 km. (10 miles) east of La Ceiba. The villagers are proud Garifuna members. The Garifuna are a seafaring culture, and fish for a living. 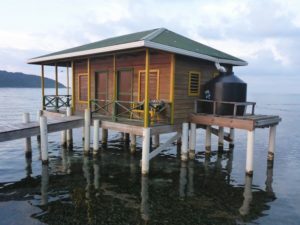 One of their fishing outposts is at Cayos Cochinos, AKA the Hog Cays. The Cays, within sight from the Sambo Creeks coastline, are only 30 minutes away in a speed boat. At Cayos Cochinos you will find several other fishing outposts. The most unique is Chachahuate Cay: a primitive looking community on a lovely white sand cay. This is the most authentic Garifuna village in the World! Cayos, as the locals call this small archipelago, is approximately 10 miles off the coast of Sambo Creek. This archipelago consists of two small islands and 13 tiny Cays, or small coral beach islands. Some of the Cays are privately owned. Lodging facilities in Cayos Cochinos are basic. 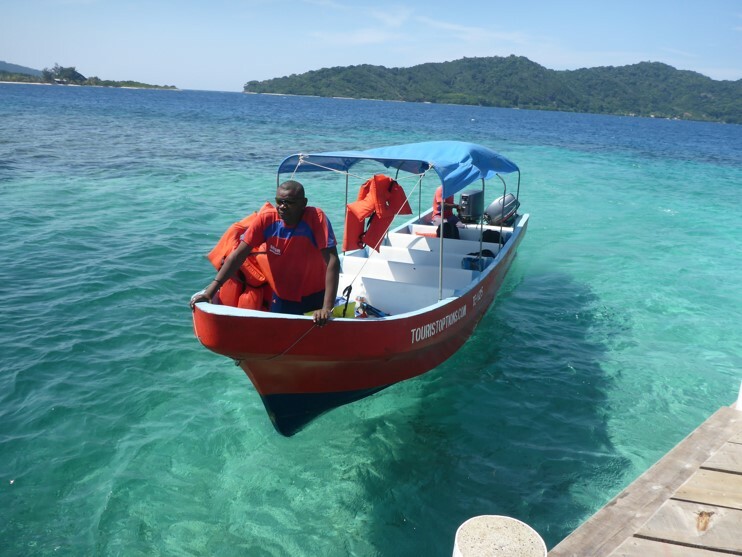 There is one dive resort on Cochino Grande, the largest of the islands. This is the Turtle Bay Harbour Eco Resort. Another option is also located on Cochino Grande, within the community of East End. This are the community owned Laru Beya cabins. Finally, there are some private homes in the cays that you can rent. Can you imagine renting a home in a private island in the Caribbean? Not only is it possible, it is also affordable! One of the best alternatives is at Cayo Largo Arriba Cay. There is a nice setting there known as Daryl’s Place. He offers several alternatives, including a full home with kitchen and a small on the dock casita for reasonable prices. The can have the perfect Central America Vacation by combining a stay at the Cangrejal River Valley and at Cayos Cochinos. Mary and Robert, from Toronto, Canada recently visited Honduras for two weeks. 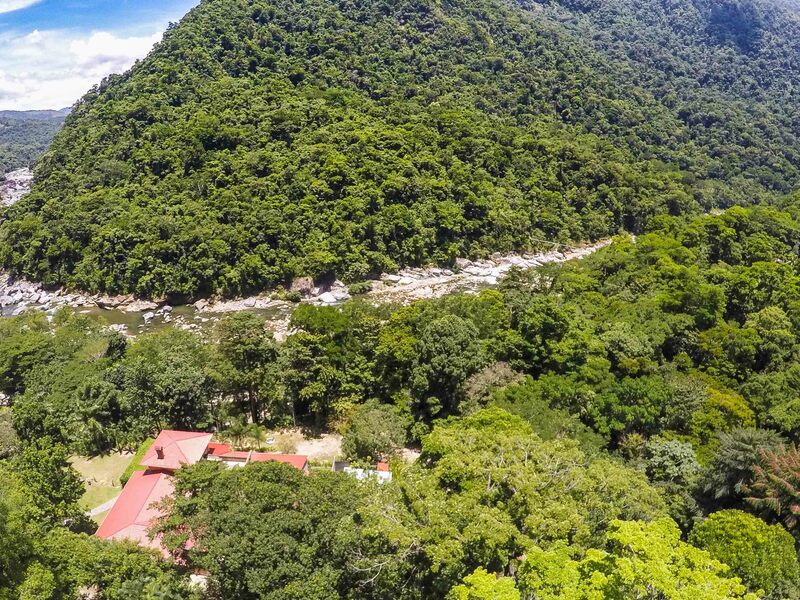 They stayed their first four nights at La Villa de Soledad in the Cangrejal River Valley. Then went to Cayos Cochinos and stayed at Daryl’s Place for a week. They came back to La Villa de Soledad for the last three days of their two week vacation. They had the time of their life, reconnected with nature and had a pleasant time. Did they feel threatened or unsafe at any moment? Not at all! For them, this was the perfect Central America Vacation. Where else can you combine a tropical rain forest setting with a pristine Caribbean Island? Only in Honduras! Come and enjoy the perfect Central America Vacation in Honduras with us! Know that you know why you should travel to Honduras, start planning your trip!